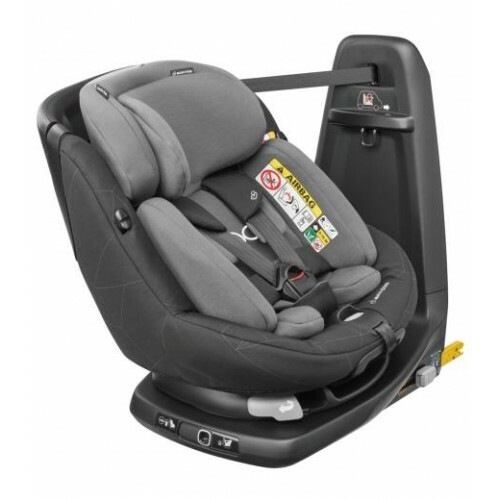 The Maxi-Cosi AxissFix Plus is a baby & toddler car seat which offers top safety and the convenience of the 360° rotation, from birth up to 4 years. The AxissFix Plus combines top safety performance, by complying with the latest i-Size car seat regulation (R129), and 360° rotation to offer you the best ease of use ever! The ISOFIX system enables a very easy and safe car seat installation, and the seat offers rear-facing travel up to approx. 2 years (87 cm) to enhance head & neck protection. AxissFix Plus, grows with your child from birth (45 cm) with its cosy enveloping inlay, up to 4 years (105 cm). It will take only a few seconds to secure your child facing you, and switch from rearward- to forward-facing in just a seat rotation.